Samgyetang, sometimes called chicken ginseng soup, is an energizing soup-based dish. It is traditionally served during the summer for its nutrients which can easily be lost through excessive sweating and physical exertion during the hot summer. 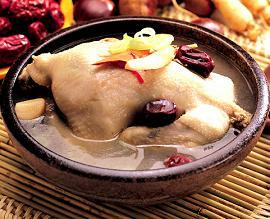 Commonly, a whole chicken is boiled in a broth with Korean ginseng, dried jujube fruits, garlic, ginger and glutinous rice. Spicy red chili pepper paste (kochujang) can be added to enrich its flavors and taste to one's preference. Like the chicken soup, which is considered to help common sickness, samgyetang is also known be cure physical ailments and prevent sickness as well.